Two men were arrested for alleged firearms offences after a morning raid by police who discovered weapons at a Peterborough property. Officers executed a warrant at around 6am on Tuesday in Uldale Way, Gunthorpe, with a police presence remaining at the scene until late into the evening. Following the arrests officers were later joined by the RAF Wittering bomb disposal unit and forensics as they continued their investigation. A scenes of crime officer was captured carrying what appeared to be a firearm out of the house. 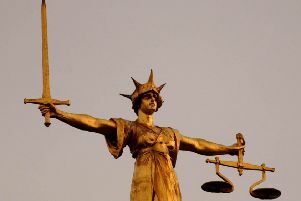 Police today charged one of the arrested men - 26-year-old Calvin Jackson, of Uldale Way - with possession of a firearm, possession of prohibited ammunition, possession of an offensive weapon in a public place, two counts of possession of a firearm during a five-year period following a suspended sentence and producing a Class B drug. Jackson has been remanded in custody to appear at Cambridge Magistrates’ Court tomorrow (Thursday). A man in his 60s was also arrested on suspicion of firearms offences and possession of a Class B drug but was released under investigation. Police have stayed tight-lipped over the raid, but a spokeswoman did confirm that a number of firearms had been recovered after officers carried out searches at the property. A neighbour who did not wish to be named told the Peterborough Telegraph: “There were police dogs and police cars. “There were a lot of photographs being taken inside the house and the garage door was open.